Scalable:The Fortinet Security Fabric protects the Enterprise from IoT to the Cloud. Aware: The Fabric behaves as a single entity from a Policy and Logging perspective, enabling end-to-end Segmentation in order to reduce the risk from advanced threats. Actionable: Big Data cloud systems correlate threat information and network data to deliver Actionable Threat Intelligence in real time. Open:Well defined, open APIs allow leading technology partners to become part of the fabric. Download Fortinet’s Security Fabric white paper today to learn more about how to arm Global Enterprises with pervasive, adaptive cybersecurity from IoT to cloud networks. Fortinet is expanding Fortune’s high-end Enterprise firewall line with the announcement of the 6040E, the first in Fortinet’s new 6000 series of ultra-high performance Next-generation firewalls. 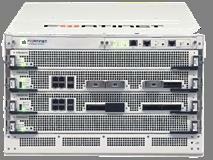 The 6040E leverages the new FortiASIC CP9 to deliver 320Gbps firewall throughput and NGFW performance of 80Gbps, in a compact form factor. The 6040E and 6000 Series take advantage of CP9 advanced capabilities to deliver SSL and VPN Suite B cryptography traffic acceleration, while meeting compliance requirements in key verticals such as DoD, federal, banking, and healthcare. Available in 6 different hardware configurations to meet customer needs, the 6040E delivers the massive NGFW performance and scale necessary to secure the largest enterprises and data centers. Have questions? Contact us at sales@finetec.com or call us at 1-888-891-9988. Copyright © 2016 FineTec. All rights reserved.